Why Choose Automated External Defibrillators (AEDs)? Businesses not only provide services to countless customers, but also have to care for their employees. Given the number of people present and the considerable amount of time and activity spent at work, the risk of someone suffering cardiac arrest at your facility is very real. Durable, cost-effective, low-maintenance, and easy-to-use Defibtech AEDs are perfectly suited for the unique needs of the business environment. Below FAQs and their answers will help you in great deal to understand the importance and requirement of AEDs. Why do we need AEDs? AEDs save lives. When a person has a Sudden Cardiac Arrest, the heart becomes arrhythmic. Every minute that the heart is not beating lowers the odds of survival by 7 percent to 10 percent. After 10 minutes without defibrillation, very few people survive. What does the American Heart Association (AHA) say about AEDs? The American Heart Association (AHA) strongly supports having AEDs in public areas such as sports arenas, office complexes, schools, doctors’ offices, shopping malls, airports, and other public places. The AHA also advocates that all police and fire and rescue vehicles be equipped with an AED. What is this Sudden Cardiac Arrest? The killer of more than 400,000 people a year in USA and more than 100,000 people a year in Pakistan, sudden cardiac arrest (SCA) causes the heart’s normal rhythm to suddenly become chaotic. The heart can no longer pump the blood effectively and the victim collapses, stops breathing, becomes unresponsive, and has no detectable pulse. SCA can strike anyone, anytime. Children, teenagers, athletes, old people — can all have SCAs. Although the risk of SCA increases with age and in people with heart problems, a large percentage of the victims are people with no known risk factors. What is the recommended treatment of SCA? Defibrillation is the only treatment proven to restore a normal heart rhythm. When used on a victim of SCA, the automated external defibrillator (AED) can be used to administer a lifesaving electric shock that restores the heart’s rhythm to normal. AEDs are designed to allow non-medical personnel to save lives. How much time do I have to respond if someone has a SCA? As said above it allows only minutes when it strikes to initiate AED. Defibrillate within three minutes and the chances of survival are 70 percent. After 10 minutes, the chances of survival are negligible. I know CPR; would not it help? CPR only buys a little more time, potentially giving the victim a small amount of extra time until a defibrillator arrives. But SCA ultimately requires a shock to restore a normal heart rhythm. As a result, most CPR training now also includes AED training. Can a non-medical person make a mistake when using an AED? AEDs are safe to use by anyone who has been shown how to use them. The AED’s voice guides the rescuer through the steps involved in saving someone; for example, “apply pads to patient’s bare chest” (the pads themselves have pictures of where they should be placed) and “press red shock button.” Furthermore, safeguards have been designed into the unit precisely so that non-medical responders can’t use the AED to shock someone who doesn’t need a shock. With Defibtech’s Lifeline VIEW AED, you can actually see what to do and how to do. So if you are not trained in use of AED, now there is no problem if you have Defibtech’s Lifeline VEW AED. Two pads, connected to the AED, are placed on the patient’s chest. A computer inside the AED analyzes the patient’s heart rhythm and determines if a shock is required to save the victim. If a shock is required, the AED uses voice instructions to guide the user through saving the person’s life. What First Aid to Save a Life Pakistan can do for us? First Aid to Save a Life Pakistan can integrates all required components of a successful AED program while ensuring compliance with local, international and industry laws. We can plan for you a worry-free AED implementation program, which is very easy to manage. Sudden Cardiac Arrest (SCA) is unpredictable. It can happen anywhere, at any time, to anyone. Quick response and early use of an AED can make the difference between life and death. By implementing a comprehensive AED program, you will be creating a safer environment for your employees, visitors and everyone in and around your facility. Now there is something you can do to improve the odds dramatically for your community, business, schools, shopping malls, health clubs, hospitality services, personal use, public access and professional rescue services with a solution that is easy to use and inexpensive to buy. Our life-saving AED program goes beyond simply having a Defibtech Lifeline AED. Our different proposed programs will help you choose one for you to feel comfortable with it and saving lives. These programs will help you prepare your people and organization before sudden cardiac arrest strikes. The bottom like is that with a modest investment, now you can have a heart-safe environment, where you live and work. 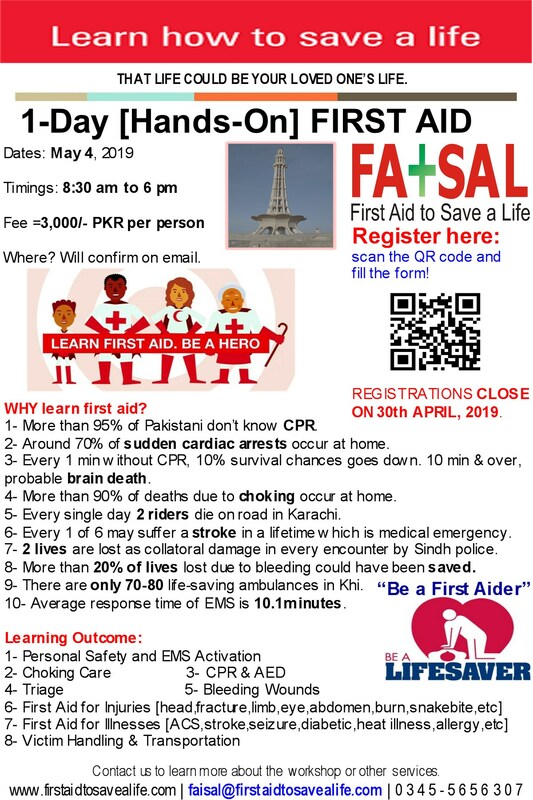 2- Program Policies and Procedures: First Aid to Save a Life Pakistan will help your organization in developing certain set of policies and procedure to ensure program readiness. With the help of your organization, FATSAL will help you defines roles and responsibilities for Emergency Response Team personnel and other administrative tasks within your organization to ensure readiness. 4- AED device installations: First Aid to Save a Life Pakistan will install AED device on the recommendations of report generated through AED placement and site survey activities. The following parts will be part of Defibtech AED device. 5- Early Preparedness & Emergency Response (Check) Drills: First Aid to Save a Life Pakistan will plan drills to record the response to gauge its effectiveness and suggest remedial action plan (if required after drill) to reduce response time and evaluate the response procedure to avoid this in future. Battery & pad notifications sent 60 and 30 days prior to expiration. Reminder emails sent 90, 60, and 30 days prior to personnel training expiration. Reminder emails on remedial action plan items (RAPIs). Kindly find attached a detailed AED Implementation Plan and a wall poster on AED Implementation Program. Contact us for details of program.